A screen grab from Energage’s home page. Energage, the Exton firm formerly known as Workplace Dynamics, has raised $15 million from investors and is looking to open a new office in Philadelphia, using 10 years' worth of corporate employee surveys as a basis for new "HR tech" services it expects will elevate its profile among clients and technology investors. "Our model has changed quite a bit. 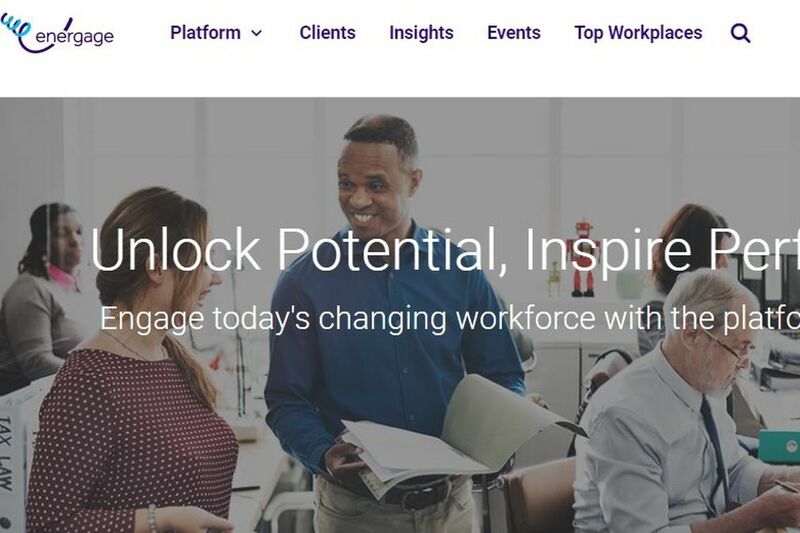 We have a whole new round of offerings in our employee-engagement platform, just two weeks ahead of the HR Tech Conference in Las Vegas," said Fraser Marlow, director of research at Energage, which employs 110, including 100 in Exton. Part of the money will be used for expansion. Energage wants to open an office in Philadelphia to hire more "creative staff and programmers," said Marlow, a GE veteran who is among several senior managers joining the company in the last year. "We've interviewed quite a few who wanted to work for us, but the commute to Exton was not quite appealing," he said. SEPTA's Paoli/Thorndale Line trains can take more than an hour to reach Exton from Center City; expresses are faster, if they run to schedule. As Workplace Dynamics, the company partnered with newspapers and media sites including Philly.com to survey local employers and assemble lists of "top workplaces." "Running all those surveys gave us a ton of data and insight into companies," said Marlow. "We're now providing tools that help [employers] engage in a dialogue with all employees and really get a good hand on what's going on on the ground." The company says it works with thousands of employers each year. As Energage, the company says it is using past survey results and new data to build what chief executive Doug Claffey calls "employee engagement," so clients can make better staffing and "culture-building" decisions. • NewSpring Capital, the Radnor-based firm that manages $1.7 billion in stock and debt investments, mostly in East Coast firms, led the $10 million equity investment. Previous investor Rittenhouse Ventures, of Philadelphia, has increased its stake as part of the deal, said Rittenhouse principal Jayson L. Tischler. "We are excited about their direction," Tischler said. • The remaining $5 million in new money is debt financing from Silicon Valley-based Bridge Bank. • The new investors also are buying out Merion Investment Partners' stake. "We had supported Doug Claffey's buyout of his partners four years ago, along with some growth capital," Merion managing partner William M. Means said. "It was an exit opportunity for us, which we chose to take given the reset of the investment horizon. The company has performed very well and represents a great opportunity for NewSpring."